For more than a decade now Bicycling magazine has been positioning itself as the “rah rah” supporter of the Lance Universe. Cover stories have drooled over Lance’s various comebacks. They have produced multi-page guides to watching Lance in the tour (sometimes made ironically irrelevant by broken collar bones). They’ve sold books about Lance written by their own Bill Strickland who, in turn has been one of the biggest Lance supporters in print. Update: Bicycling’s Editor-ic-Chief dropped me an email and pointed out that Strickland’s book was NOT published by Rodale. My apologies for the factual error, and kudos to him for not being as harsh on me as I was on his publication. So now that the doping allegations are getting heavier and louder it’s good to see Bicycling sticking by their past decade’s editorial assertions—Lance wins because he trains harder, Lance wins because he’s got a bigger “engine,” Lance wins because he’s genetically superior—with a cover story that explains why they’ve been promoting his every move for 10 years like it was God himself on a bike with a reasoned look at the rumors and allegations that have been around forever and debunked them. Actually instead Bicycling is selling copies with a massive cover shot of Lance looking a bit bedraggled that has the tag line “He’s Done: But is He Finished?” Seems that now they think that Lance has doped. And they’d like to have you buy their magazine so they can string together the elements that have helped them draw that conclusion. Nearly all of these allegations have been around the entire time the magazine’s been raking it in supporting Lance but now I guess with a federal investigation chugging along it’s a better idea to weave this into a Lance the anti-hero article. What has really gotten my ire is Strickland’s feature, which draws the “he’s guilty” conclusion based on a number of conversations he’s had with people over the years who have told him stories about doping but who have refused to go on the record. That’s really shoddy journalism at best (“I’m just going to defame someone’s character here, but I won’t tell you who provided my information, nor will I back it up with any research.”) I’m sincerely hoping that Strickland gets a nice big subpoena to testify since he’s clearly got evidence he feels will bolster a federal racketeering case. I’m not looking to defend Lance here—my reply about his possible doping has long been “gosh I hope not” but it’s tasteless and disgraceful for a magazine to spend years making a huge amount income from the headline-friendly treatment of an idol and then to profit from his downfall. 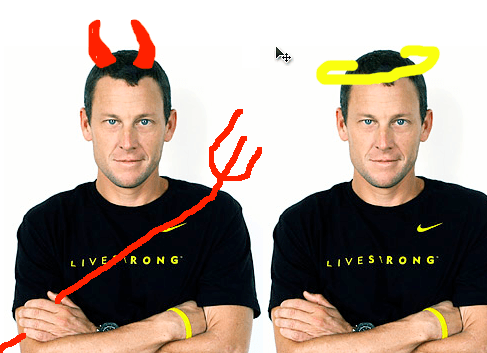 Finally, if Lance did dope, magazines like Bicycling are partially culpable. His revenue, his fame, his notoriety was borne on the back of their rising circulation numbers and any illicit drug use would have been to keep that very same fame and fortune alive.